You Are Here: Home » Hair Treatment » How To Prevent Hair Loss? Experiencing hair loss can be an upsetting and difficult time for anyone going through it. For men and women, full hair on their head is the crowning glory. Our hair has a huge influence on our confidence and how we present ourselves to the world. There are lots of products claiming to miraculously cure hair loss, thinning and all related concerns but you are probably still searching for one that actually delivers. 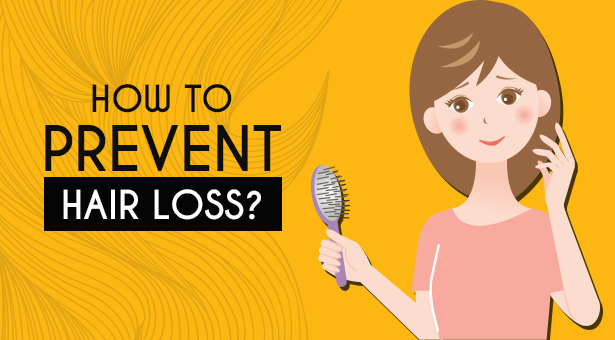 Understand what causes hair loss and how you can protect your hair from further breakage. Female pattern hair loss (FPHL) & Male Pattern Hair Loss (MPHL), both are a distinctive form of hair loss that occurs in women & men with androgenetic alopecia. There is diffuse thinning of hair on the scalp due to increased hair shedding or a reduction in hair volume, or both. For women, it is normal to lose up to 50-100 hairs a day. FPHL results in thinning hair on the mid-frontal area of the scalp and is generally less severe than occurs in males. Male pattern hair loss is an inherited condition, caused by a genetically determined sensitivity to the effects of dihydrotestosterone, or DHT in some areas of the scalp. DHT is believed to shorten the growth, or anagen, phase of the hair cycle, from a usual duration of 3–6 years to just weeks or months. This occurs together with miniaturisation of the follicles, and progressively produces fewer and finer hairs. Several genes are involved, accounting for the differing age of onset, progression, pattern and severity of hair loss in family members. The susceptibility genes are inherited from both mother and father. Females that are losing their hair with age are more likely to present with female pattern hair loss, in which hormone tests are normal. There is no one-fits-all solution to hair loss or thinning. Products can often slow down the process but they are rarely able to reverse the problem. Making some small changes in diet such as eating more iron can help with your hair’s health. Spinach, kale, nuts, dried apricots and brown rice are all excellent sources of iron. Hair is made of protein so an adequate daily portion of protein is vital for healthy hair. Managing your stress levels can help the health of your hair. Some people find light or low impact exercise like yoga, swimming, and/or Pilates to be very effective. Others feel acupuncture, meditation, cognitive behavioural therapy and/or mindfulness helps them to cope with stress. Do what works best for you. Over washing your hair can trigger hair thinning or loss. Try to avoid washing hair more than two or three times per week, as over-washing can stimulate the sebum glands leading to hair becoming weighed down with oil and looking finer and even lank. Skin City India’s Trichology Clinic offers a wide array of services in hair diagnostics, treatments, and surgeries. We help men and women restore their mane with personalised hair restoration solutions for men/women suffering from varying degrees of hair loss. We understand that you want your hair to look both natural and fabulous. The hair loss treatments offered by us are not just incredibly affordable, but we also pride on ourselves to have provided client satisfaction and reputation, with each customer treated in the same way regardless of their budget and requirements. Skin City India is one of the very few centres to adopt cyclical therapy to give excellent results in hair fall. Popular worldwide as Cosmedico technology, it has been adapted in India for the first time at Skin City India as ‘Skin Transportation’. It is a unique treatment using skin transportation, which involves withdrawing a patient’s own blood, processing it so that only the enriched cells (platelet-rich plasma) remain. Bio-modulation of a balding scalp with a unique LED technology is a recent hair growth therapy. It yields best hair growth when used along with skin transportation Mesotherapy. When suffering from significant hair loss, Mesotherapy/ PRP, hair transplantation, along with scalp micro pigmentation can be added at the completion of these procedures to give maximum scalp coverage look. Hair transplant surgery has, without question, is showing the most effectiveness. Our advanced FUE & FUT system enables the creation of natural looking hairlines, eyebrows, and eyelashes. At Skin City India, everyone is taken on a journey, beginning with the consultation, through to the surgery itself and the aftercare afterward. Are you ready to take your first step towards a full head of hair? Call us at 9890225577 and one of the team will be in contact to arrange your first consultation. What Causes Hair Loss in Teenage Males?